The Frog Medicine Spirit brings creativity, cleansing, patience in life transition and acceptance. I was working in the garden. When Frog Medicine hopped in to my life. 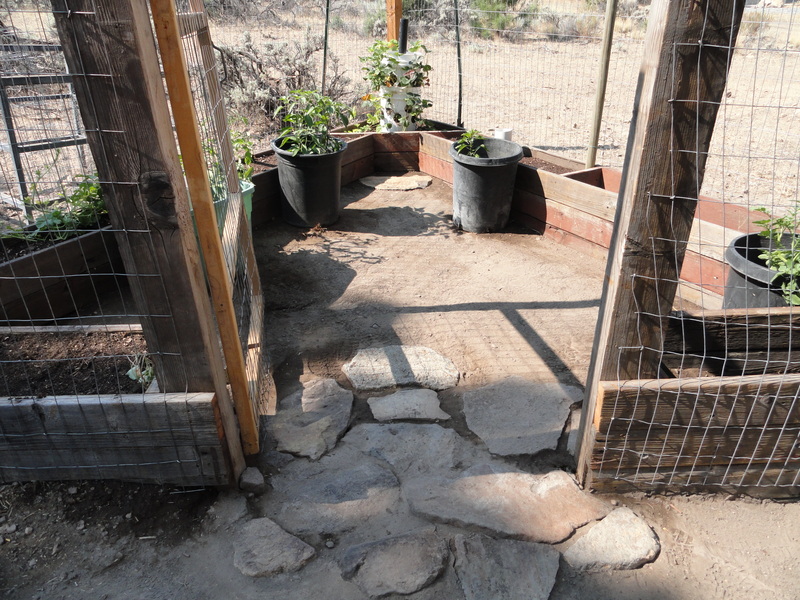 I had just expanded our garden area to included a pyramid shape not because I am Illuminati. The pyramid shape allows for fewer holes to be dug for posts. 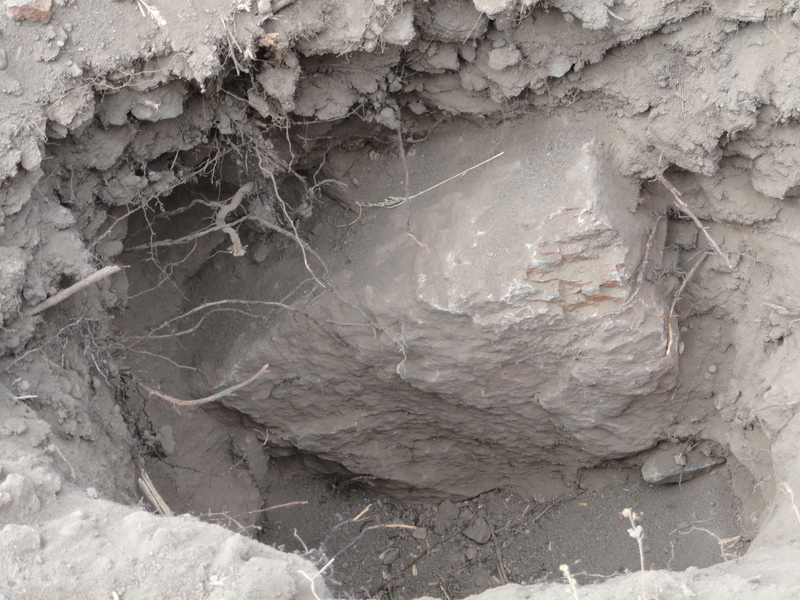 In our rocky soil and Pyroclastic flows, digging fewer holes is a blessing. I have to admit, I am hoping that the shape adds energy to our garden. Not to mention I only had 42 feet of fencing. This shape just made sense for the area and materials I had to work with. I dry laid the stone. Yep, more digging, but the stone was free. Just had to walk around the yard and pick them up. For some odd reason I enjoy doing this with stone. Anyway, I was moving some planter barrels from one area of our garden to the pyramid and out popped three frogs from under the barrel. Sorry frog for disturbing your day! So I put the barrel back and made a place for them to live under the barrel they had chosen for their home. Hey, Frogs are people too! There are few species of frog who actually care for their offspring. After mating most frogs abandon the eggs. 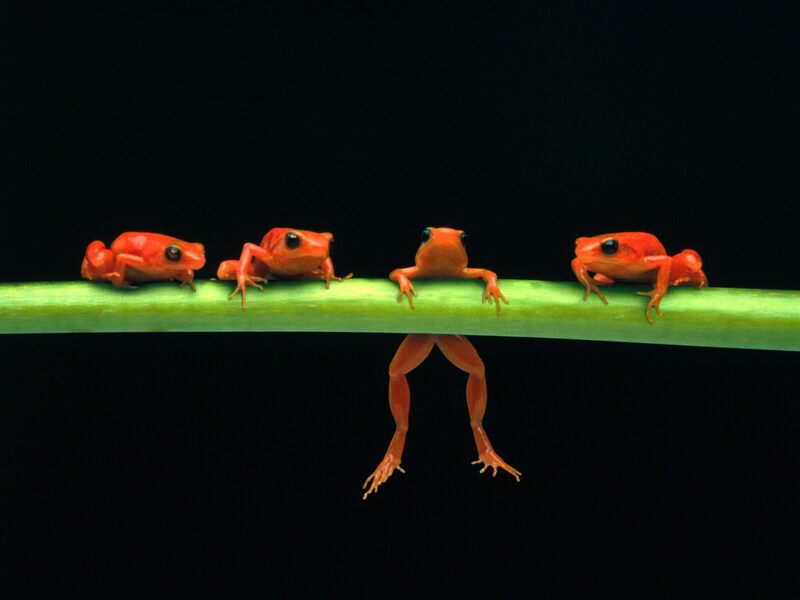 Because of this, lessons to do with survival are common in people with Frog Medicine. 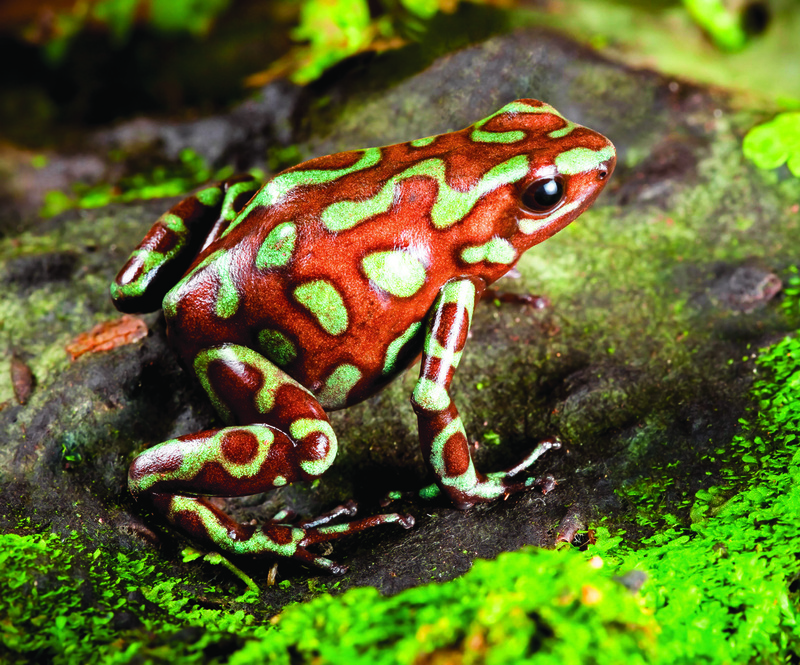 Scientists believe that the frog populations health reflects the health of the entire eco-system. The frogs must like our Garden. Frogs are good signs. The Frog is a doctor and healer, seer and fortune-teller. The Frog is a messenger of rain, and the power of the Frog can bring rain and water if one knows how to use its power. Call the rains, Quench the dryness, Cleanse the Earth. Than fill me up again. Frogs have a tremendous mythology and lore about them. They have been associated with the Faerie Realm and Egyptian goddesses and gods (Herit, Isis, and Osiris). To some people’s of the Amazon, they call the rains and influence the climate. In Europe they are often associated with healing. Whenever frog appears, we are entering a time of new beginnings. The creative energies are awakening, and it is a time for new birth and new starts. The symbolism of the Frog Medicine appears in many traditions around the globe. This animal is generally associated with the water element and its cleansing attributes. 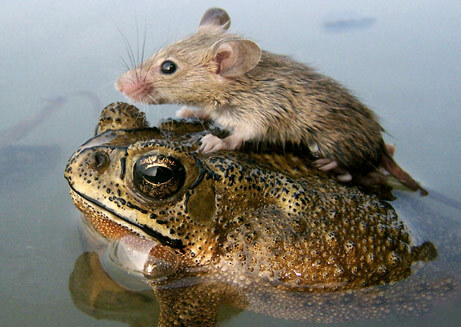 A frog is an adaptable creature that feels comfortable and maneuvers well in both the water and land. They are able to live in two very different worlds. They teach us how to properly cleanse and adapt. Frogs are keenly attuned to sound. They possess a very sensitive tympanic organ, and their element (water) is a tremendous conductor of sound vibrations. 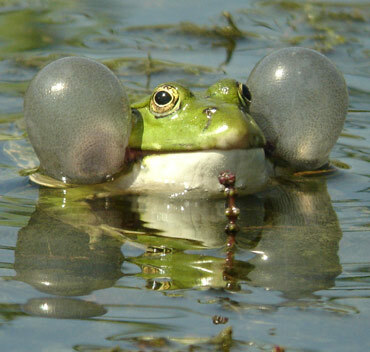 Their croaking is a means of attracting a mate. If frog has appeared, we should listen for new opportunities and know that our ability to persuade and influence people to take part in new beneficial endeavors is very great right now. Frog’s appearance heralds an awakening of the unique and creative powers of our own voice. It is a wonderful time to explore and seek out a new career, job, or way of life. The appearance of the frog is a reflection of the maturity and transformation from the polliwog stage. It is time to hop into new areas of endeavors. It is beneficial to accept invitations and offers. Frog Medicine can help to recognize how stress and stressful situations will bring a whirlwind of negative energies into our life, and teaches us to constantly refresh ourselves to keep from getting burnt out. Frogs spirit brings creativity, patience in life transition and acceptance. 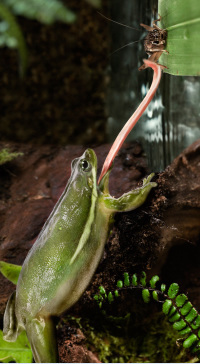 Frogs adapt themselves to land and water, and are able to live in two very different worlds. They teach us how to properly cleanse and adapt. The frog spirit animal or totem reminds us of the transient nature of our lives. As a symbol of transition and transformation, this spirit animal supports us in times of change. Strongly associated with the water element, it connects us with the world of emotions and feminine energies, as well as the process of cleansing, whether it’s physical, emotional, or more spiritual or energetic. The Frog Medicine Spirit Totem can help one to leap out of their established habits, so one can start anew and open up to new opportunities. Frog is the totem of metamorphosis. It symbolizes coming into your personal power. It reminds us not to become bogged down with day-to-day living. Some of us have it, Some of us don’t. Hang in there! Since Frog is the totem of water. Its voice calls forth the rains. Emotions are associated with water and Frog Medicine may be telling you to get in touch with your feelings. 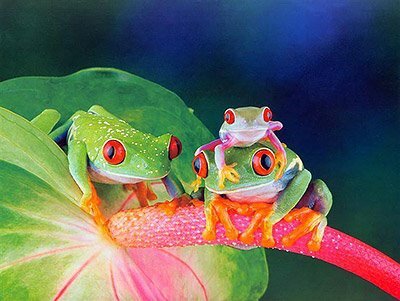 Frogs are amphibians, spending their early life nurtured in water and once they emerge on to dry land as frogs. They are never far from a water source. The frog is recognized as a healer in North and South American Native customs, as well as Celtic traditions. People with Frog Medicine give support and energy where it is needed. They can cleanse the negativity from an environment. Become a great listener and advice giver. Frog people know how to relate to others and always know exactly what to say. Have genuine empathy towards others and always do their best to provide the healing for those around them by allowing them to release old negative energy in order to help them cleanse and renew their lives. When frog jumps into your life it may indicate the time is now to find opportunities in transition. It is there to help you swim easily through some tough life changes. Often travelers use Frog Medicine to give them a little reassurance while traveling. It may also signal the need to enhance your intuition, and strengthen, your connection with the spirit world. Frog also symbolizes coming into your own personal power. Frog Medicine includes a gentle reminder of the common bond with all life, singer of songs that celebrate the most ancient watery beginnings, transformation, cleansing, understanding emotions, rebirth, healing, water energy. Diving to the depths of a pond, Frog can teach to retrieve hidden wisdom and ancient mysteries. The ability to enter in and out of this state also indicates an adaptable nature and readiness for sporadic and sudden changes. The watery world speaks of emotion, empathy, and spiritual rebirth. Frog Medicine will teach the skills and benefits of regular meditative sessions, trance work, and working with lunar tides. If your life seems mired down it is time to learn to enter the waters of purification and cleanse the negative energies that are creating muck. The changing stages of Frog’s growth will tell you where you are standing at any given point from a pollywog, to a tadpole, to a mature initiation into Spirit. Once complete, the transformation that Frog initiates into your life is then a replenishment of your own expended energies and you will feel like “hopping to it” as you apply your new skills. Divination, clairvoyance, and sensory perceptions are all areas that Frog can instruct as a guide or a teacher. Once Frog has had his time in the Waters of Consciousness, bathed in the refreshing rains, and transformed himself in the initiatory process, he hops on shore to bask in the sun and dine on the bounty life offers. Frog unites the elements of water and earth, bringing joy, delight and healing in its singing and hopping, leading you to the sacred spring from which you may be refreshed and renewed. A cold-blooded creature living half on the land and half in the water, the frog possesses an extremely sensitive skin, considered magical by Shamans/Doowans. A companion of the rain spirits, frog can help develop your sensitivity to others, to healing and to sound through your skin, your whole body and aura. Nothing is what it seems to be, and life is more fun than maybe first supposed! There is a hidden beauty and hidden power in all of nature, as you open yourself to this you will feel close to the goddess/Great Spirit and close to both the earth and water. Look for the beauty and the magic behind appearances. Frog has been a Goddess symbol of rebirth since the earliest Neolitic times. It has been made into figurines, painted on walls and ceramics, and engraved on stone. In Mayan and Aztec shamanistic practices, the shaman places water in his or her mouth and sprays it over the body of a patient to clear away negative energy. This is done while holding the thought of Frog firmly in the mind so that healing may occur and the patient may be replenished with positive energy. Sometimes dried and stuffed Frogs are also used to guard the person’s body during the session. Frogs are to be found world-wide. Their bodies were created for jumping and their sharp eyes help them catch prey, mostly insects. As a frogs eyes protrude from the sides of their heads, they have almost 360 degree vision, providing them with excellent depth perception. 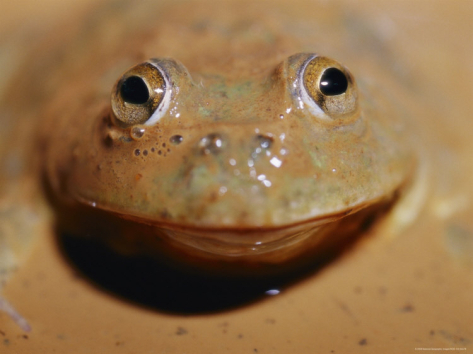 Frogs also have a highly developed sense of hearing. Behind each eye is found a large disk membrane, an external eardrum that picks up sound waves and transmits them to the inner ear and then to the brain. Combined with their extraordinary sight, this gives them clairsentient and clairvoyant abilities. 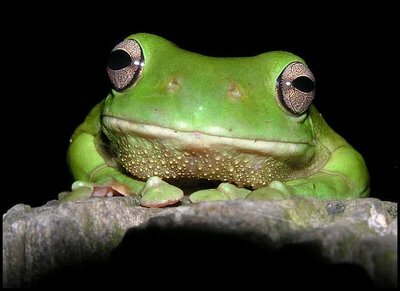 The way in which frogs produce sound is similar to the way humans do, by forcing air from the lungs over the vocal cords. They posses a variety of complex calls from “ribbets to croaks”, connecting this with language. If this is your power animal, you have the potential to take command of the spoken word. Often frog people are bilingual. Frog sings the songs that bring the rain and make the road dirt more bearable. Frog medicine is akin to water energy, and the East on the medicine wheel. Frog teaches us to honor our tears, for they cleanse the soul. All water rites belong to Frog, including all initiations by water. 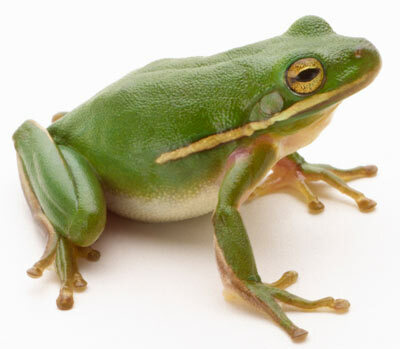 If Frog hopped into your life today, its “ribit” may be calling in the cleansing you need. If you were to look at where you are today, would you use any of the following words to describe your condition: tired, overloaded, harried, frustrated, guilty, itchy, nervous, at a loss, empty, or weakened? The key thought is to find a way to rid yourself of distractions and to replace the mud with clear energy. Then replenish your parched spirit, body, and mind. Hey, Don’t laugh. Mother said there be days like this. An ability of Frog medicine people is to give support and energy where it is needed. A Frog Medicine person can clean negativity from any environment. 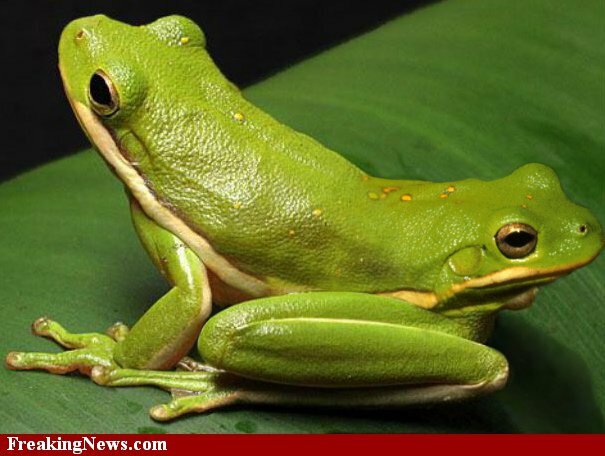 Many mediums and clairvoyants who work with cleaning “haunted” houses carry Frog Medicine. Many of the world’s seers use water on their hands when tapping into other realms of reality due to water’s super-conductive nature. Frog speaks of new life and harmony through its rain song. 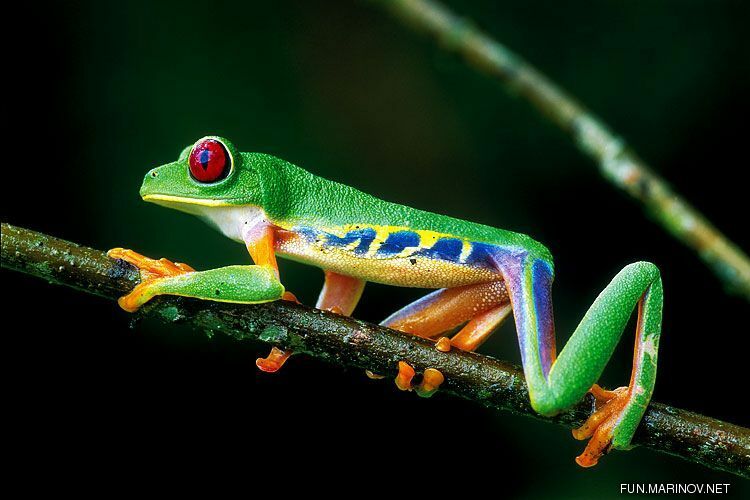 The deep tones of Frog’s “ribet” are said to be a call to the Thunder Beings: thunder, lightning, and rain. The “ribet” is the heartbeat that comes into harmony with Father Sky and calls for the replenishment needed. Call to Frog and find peace in the joy of taking time to give to yourself. A part of this giving is cleansing yourself of any person, place, or thing that does not contribute to your new state of serenity and replenishment. Frog has slipped in the mud and is lying on his back, unable to right itself. Get ready for more mud in your eye. 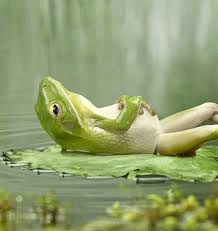 The contrary position of Frog can denote an unwillingness on your part to wipe the mire out of your life. Mud can turn from mire to bog to quicksand if you don’t recognize its effect on your present situation. Is someone draining your energy? Are you allowing yourself to ride down the tubes with them? Have you tried to settle someone quarrel and gotten in the line of fire? Stop! Recognize what it is that is mucking up the lily pond. Swim with Frog. Frog’s bug eyes see it all. Dive deeply, and then hop to the next lily pad to catch the sun. in this way you may see exactly what has drained your energy. At times, all of life’s activities can be overwhelming, and everyone occasionally needs a break. Contrary Frog Medicine can signal one of these moments, but can also portend a time of feeling waterlogged. In feeling waterlogged, you may be dealing with too many emotions or feelings. This is to say that “the world is too much for you,” or that you have immersed yourself in one idea or activity to the exclusion of all other facets of your life. If this is the case, a break from routine is suggested. Hop to other lily pads or visit other ponds for a while. Negativity is drawn to you when you refuse to give yourself the time and space needed to assume a new viewpoint. Frog in the contrary position is an omen that you are courting disaster if you don’t stop and smell the lilies, eat some flies, bask in the sun, and “ribet” until the rain comes to refill your spirit. Frogs in Space. There’s life on Mars. If frog is in your dream and leaping, it may suggest that there is a lack of commitment in your life and you are leaping from one thing to another. If you are trying to catch a frog in your dream, it may mean that your life is changing rapidly, and you are trying to stop it or prevent the change from occurring. To kill a frog in your dream, represents negative emotions. 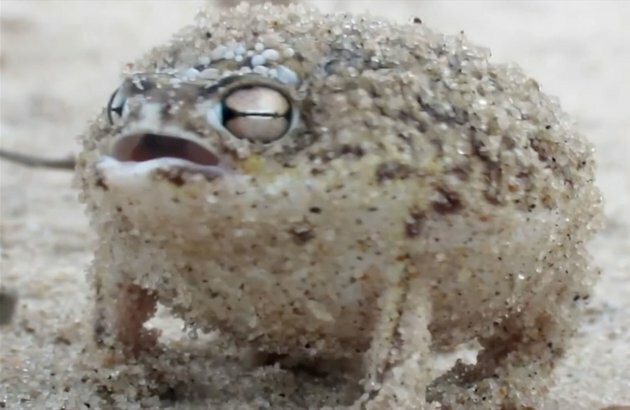 If you swallow a frog in your dream, you are most likely holding back saying something that needs to be said, or you feel that something is preventing you from expressing yourself. The deepest healing will always take place, and be fulfilled on the emotional level. Emotions are linked with water, especially tears. Some of us, especially men, are brought up to believe that crying is something to be ashamed of, that you are weak, wimpish or childish if you cry. When we deprive ourselves of this powerful form of emotional release, we bottle it all up and this can cause us to eventually reach unbelievable lows in our lives. Energies become blocked. With the frog’s assistance, we can begin to realize, and experience, tears as being natural and as necessary as rain. Frog Medicine is strongly linked with transformation and magic. Generally frogs undergo a two stage life cycle. They start off as eggs, hatching into tadpoles, limbless aquatic larva with gills and a long flat tail. Legs and lungs develop, and the tail gradually disappears as the tadpole approaches the adult stage. This denotes the awakening of ones creativity. When frog enters your life, it is an invitation to leap into your creative power. In order to do this, it is helpful to know which stage of life you are presently at. 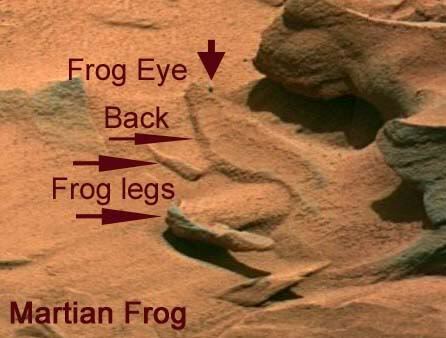 By studying the frogs characteristics you will discover this. This is yet another reminder to us that life is about evolution, a miracle of change and transformation. If you are feeling froggy, just jump. This teaches us that in order to heal ourselves and others, it is often required to face that part of us that we have hidden from ourselves, because we find it unacceptable or ugly. When we can honestly look all aspects of ourselves, and accept them, we will find the ugliness has washed away. Our true beauty shines, like the sun after healing rain. If Frog Medicine has hopped into your life today, its “ribit” may be calling in the cleansing you need. We all need a lift now and then! Frogs are people too! Ribet yourself to a cleansing. Frog Medicine brings creativity, cleansing, patience in life transition and acceptance, We promise not to pee on you and give you warts. Thanks for the great site you’ve created. Your enthusiasm is definitely inspiring. Thanks again!